Tourbillon Solo (46'19") by Gregory Taylor & Darwin Grosse will surely be noted as having been influenced by Gamelon music. However, the true relationship their work has to that of Bali and Java is in how it deals with the idea of time. More than just breaking up large swaths of chronology into well-ordered, evenly spaced rhythmic intervals, Tourbillon Solo has the listener experiencing the passage of time in a different, non-western way. The vast designs of Tayor & Grosse conjure a hidden world of both spirits and cyberspace. The ideal listener, one who is wishing to be entertained, yet is not averse to being enlightened, will appreciate Tourbillon Solo's highly cerebral time signatures and intelligently arranged configurations. Primarily using sounds and tones reminiscent of mallet instruments, rhythm and melody overlap in broken chords. Notes are played in succession, in alternating cycles, rapidly then slowly, lightly then firmly, in the hammering and tapping of exotically tuned metal and wooden tines. Melodies move in conjunct and disjunct motion, from an intimate and exact hallucinatory stillness to untamed multiple strands of urban trance. 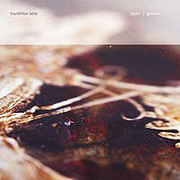 In these more energetic states Taylor & Grosse bring forth a realm where the air seems completely electric and activated in grinding, braided rhythms. Where are these urges coming from? This album may be a test of range, which this duo ably passes - but can we? Does our attention remain with the formal, the metallic pulsing and beds of digital atmosphere, or better we use these seven stirring compositions to project to a place outside of the successive moments of the day-to-day?